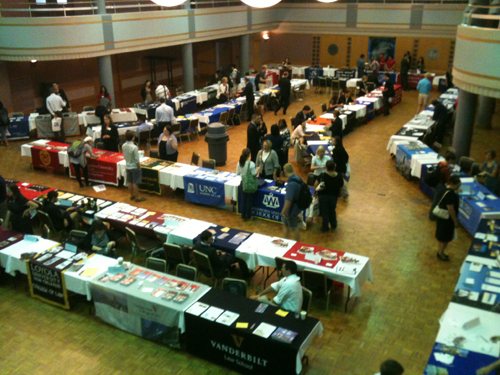 Yesterday, W8Sep10, I attended the University of Kansas Pre-Law Day. I was volunteering as a member of Phi Alpha Delta to help out the University Advising Center by collecting survey data from attendees as they left. There isn’t going to be much I can do with ΦΑΔ this semester, due to a class that I could only fit in on Tuesdays (the day that ΦΑΔ meets), but I can do little things like this. So I stood there for an hour chatting with friends as they passed by and getting people to fill out five or six questions on a hand-held device. 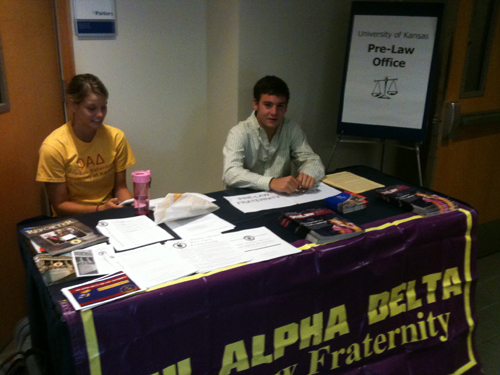 ΦΑΔ also had a table right at the front door where we were handing out bags for interested students to collect law school brochures in, as well as getting the word out about our pre-law chapter of the fraternity (there is a separate chapter for the current law students in Green Hall). This is also how I got recruited into the chapter last year. This was in the ballroom at the Kansas Union, and many law schools were represented there. It may have just been the time I was there, but it didn’t seem like there were as many people as there were last year. I saw several of my classmates from the Cambridge Pre-Law institute, which is always good. I took surveys of the law school fair experience from about thirteen people in that hour, and somehow also a survey for a freshman orientation that happened who-knows-when but was an option on the hand-held (oops). After that I had an hour to go through the fair myself, eat lunch, catch up on my Brit Lit readings and make it to Wescoe for class. I tell you, it’s 100mph or sleeping like a log these days, and not much in between during the weekdays. 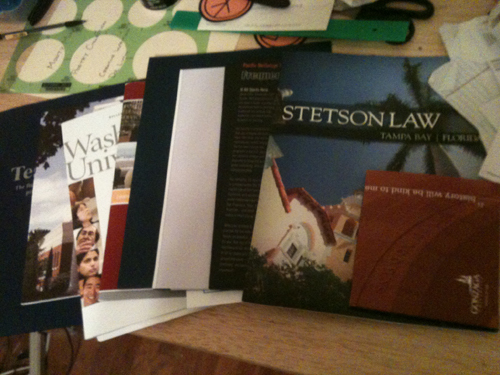 But anyway, I collected the above brochures for local law schools and law school in the Pacific Northwest, which I’m thinking about moving to if I can get into a law school there. I’m also toying with the idea of law school down home in the Georgia-Alabama-Florida area, because that is the Mother Land. Not much to really talk about, but it was something positive I did, so deserves a mention on RA.